I have been starting to share some of my favorite salad combos at the site! I always make one H-U-G-E bowl of salad once a week for us to eat off of. We eat it as a side dish (sometimes a main dish) and we L-O-V-E leftovers for lunches. It’s really all about what’s in the mix & the layers of flavors. When I make this particular salad, I often make it in my beautiful deep, handled blue bowl that I get tons of compliments on. It was an accidental clearance find at Home Goods. I just LOVE when that happens. Anyway, because I make it in a deep bowl I like to layer the veggies so that when you scoop deep you’re getting lots of layers of flavor all of the way through. 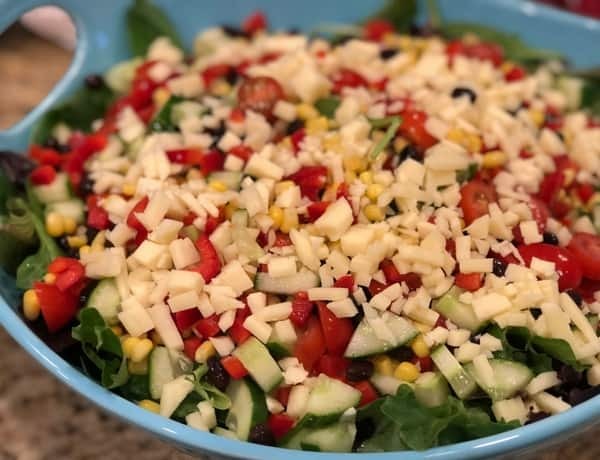 It’s a great salad for entertaining. Repeat these layers three times in a deep, big bowl. P.S. I just made this corn, bean combo for a group of friends & it was a definite crowd pleaser (they’re great taste testers for anything I want to share on the site with valuable feedback = love my friends). Yummy, yummy, yummy! Looking for more salad combos? 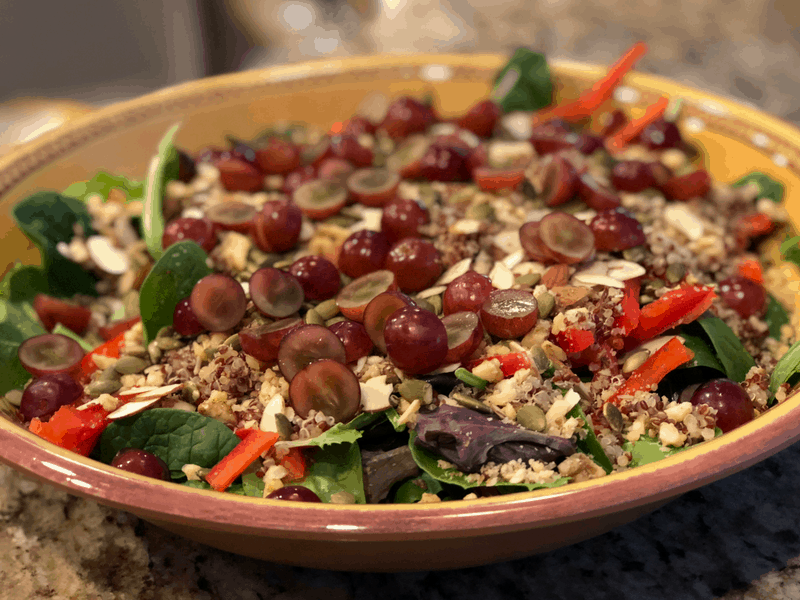 CHECK OUT my Nutty Quinoa Combo that is absolutely scrumptious! Simply click here for more salad bites. Mmmm we make a salsa style similar too. In fact, it will be on this week’s salmon :)…. Thank you! Yes, colorful is always the description people use when I serve this combo :)…. Alicia OBrien, thanks!And thanks for sharing your great posts every week! I love the combination for your beautiful and delicious salad! Thanks so much for sharing your awesome post with us at Full Plate Thursday. Have a great week and come back soon! MMMMM love salad season :)! Have a great week….and, thank you.